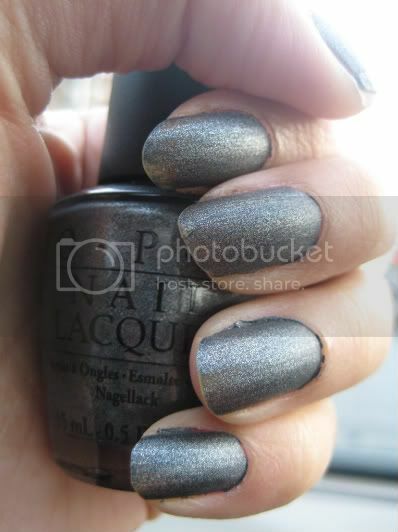 This is my other OPI Suede purchased about three weeks ago, it's the first time I remembered to wear it though. This is what happens when you have too many nail polishes. Anyway, I don't own the regular version of this nail polish , but from what I remember it was a dark blue gray while the suede version is more of a gunmetal shade. It's pretty much the same as You Don't know Jacques in terms of discrepancy between the colours of regular and suede versions. I love the look of this polish though. This is only one coat and it's opaque enough for me. The application was a breeze and it dried super fast. I'm really digging the suedes that I bought. 3 Responses to "Suzi Skies in the Pyrenees Suede"
I really love the suedes too; this shade looks really pretty on you! PS - My verification word is "fight". Wha?